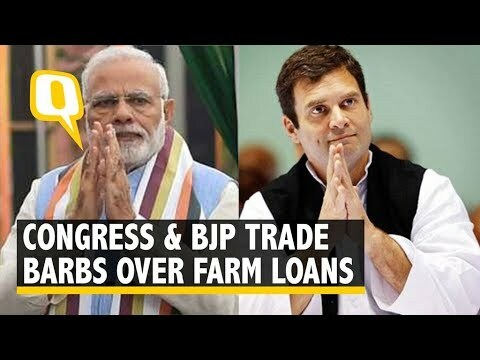 Home Latest Stories BJP, Congress trade barbs over farm loan waiver. BJP, Congress trade barbs over farm loan waiver. Senior BJP leader and Union Minister Prakash Javadekar has accused Congress of betraying farmers in the name of loan waiver in the states where the party is in power. Talking to mediapersons in New Delhi on Tuesday evening, Mr Javadekar said, BJP will expose Congress on the issue by bringing out the exact status of loan waivers promised by it. Congress President Rahul Gandhi has said his party will implement minimum income guarantee scheme if voted to power in Lok Sabha elections. Addressing a Jan-Sankalp rally at Adalaj in Gandhinagar district of Gujarat, he said, Congress waived farm loans in Rajasthan, Madhya Pradesh and Chhattisgarh within days of forming governments. Mr Gandhi youth are struggling to find jobs despite Make In India and Start-Up India initiatives. He alleged that the previous BJP government had freed Jaish-e-Mohammed chief Masood Azhar. Congress General Secretary Priyanka Gandhi Vadra also addressed the rally and appealed to people to be vigilant. In her address, she asked people not to fall prey to meaningless issues. Earlier, top party leaders, including Rahul Gandhi, UPA Chairperson Sonia Gandhi and former Prime Minister Dr. Manmohan Singh attended the Congress Working Committee meeting held at Sardar Smarak in Ahmedabad. Previous articleNew Zealand bans Boeing 737 MAX aircrafts. Next articleVehicles appear to cause more pollution, observes SC.